If you love pinball like I love pinball -- and you want your own, real pinball machine -- then this article is intended for you. Pinball has been with us since the 1930s, and though it long ago took a back seat to video games, pinball machines have never completely gone away. Call it nostalgia, or a desire to play a "real" game -- one with moving parts -- but there is a reason you can still buy a new pinball machine, if you have the desire and the dough. Who Makes New Pinball Machines You Can Buy Online? Though there have been brief periods in the last 25 years when no companies made new pinball machines, for more than a decade now, America's Stern Pinball, Inc. has kept the ball rolling -- and in good form, too! Stern does a strong job here of hearkening back to the kinds of pinball machines that were a big deal in the 1970s. This machine is perfect for a "townie" bar, or a rustic man cave. 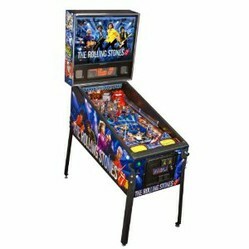 If your love for The Rolling Stones "can't get no satisfaction", then owning a limited edition Rolling Stones pinball machine from Stern should be just the thing to take your Stones' memorabilia collection to the next level. Of course, the Rolling Stones machine has the range of pinball play elements for which Stern Pinball has become known. See Stern's Rolling Stones Limited Edition Pinball Machine in Action! If a movie-themed pinball machine is on your mind, then a Transformers Pro machine may be just your thing. Especially if you are a fan of the long-running Transformers franchise (and you have the scratch to pick up one of these beauties), this machine is probably calling your name! As always, with Transformers, there is "more than meets the eye! ", and that is true of this Stern pinball machine! If you have read this far, you must at least be seriously considering buying a new pinball machine. To help you find all new Stern pinball machines available for sale online, here is a link to search results for "Stern pinball machines" on Amazon. I hope you have enjoyed bouncing through this article on new pinball machines, and I would welcome your comments.